There can be a lot of debate online on the topic of paid vs. free education, but in reality, most traders educate themselves with some kind of free informal education. This does not mean that the paid education is totally worthless or that traders that prefer free education don’t actually spend money when they learn and improve their skills. 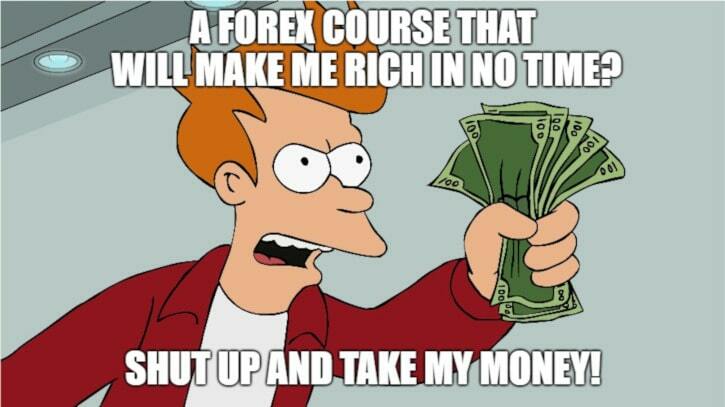 There are many free Forex courses available online. Even EarnForex.com offers one. Yet many traders opt for paid courses with prices varying from about $12.99 (many courses available on UDemy) to $24,000 (an MBA with a Global Finance Trading Concentration at the London Academy of Trading) to $50,000 (Platinum package at Champion Traders Academy). For some people, paying thousands of dollars for an education course might seem like an overkill and a waste of money, but if you consider the fact that professional traders rarely trade with capital lower than $100,000, it might be worthwhile to spend some serious money on learning not to blow your account with subpar trading. I am not a proponent of paying so much for a trading course, but I can reasonably see someone doing it. Another popular educational facility widely available to FX traders online are webinars. Forex webinars are usually free an are in abundance offered by retail Forex brokers. Traders rarely spend money on webinars. One important but often overlooked expense is money lost on “practice” live accounts. It is a common routine by many traders to test their strategies in a 3-stage process. First, they backtest it on a past data. Then they move on to forward-test it on a demo account. If everything is OK there, a strategy is usually applied to a small live account (usually a Micro account type) to see how it works with a particular broker. Oftentimes, traders even skip the demo testing part because some strategies are not suitable for demo testing at all (for example, there is no point in demo testing a news trading strategy because demo accounts don’t let you test widened spreads, wild requotes, or terrible slippage). Real funds lost in such trading accounts is just another way to spend money on improving your skills. Needless to say, that when a newbie trader decides to skip demo trading at all and jumps from an introduction to Forex directly into a fully funded live account, his or her losses should be counted towards obtaining a foreign exchange education too. I myself like the idea that currency traders can get away with mostly free education with the exception of a few books and the money used on the live test accounts mentioned above. However, considering all the money lost on experimenting with some rather crazy strategies, I could probably suppose that the total bill for my education is rather long. And how about you? How much have you spent on your education as a Forex trader? Nothing at all. Everything I've learned I found for free. Do you want to share some details on your expenditures towards getting a Forex trading education or improving your skills? Post them using the commentary form below! How Educated Are Forex Traders?